While the last post talked about how thunderstorms form, it didn’t discuss either thunder or lightning (it was getting a bit long). So let’s talk about that! Lightning is a discharge of electrical energy between different regions within a thundercloud, and it’s a byproduct of a thunderstorm, not a critical element to the storm’s formation. What is critical is the updraft that pushes lots of moisture into the atmosphere where it condenses and forms a thundercloud, and it’s this updraft that is thought to be what drives the electrical structure of a thunderstorm as well. (The precise mechanism is not totally understood.) The updraft forces the circulation of particles within the cloud. As ice and water particles collide within the cloud, they form and break apart. 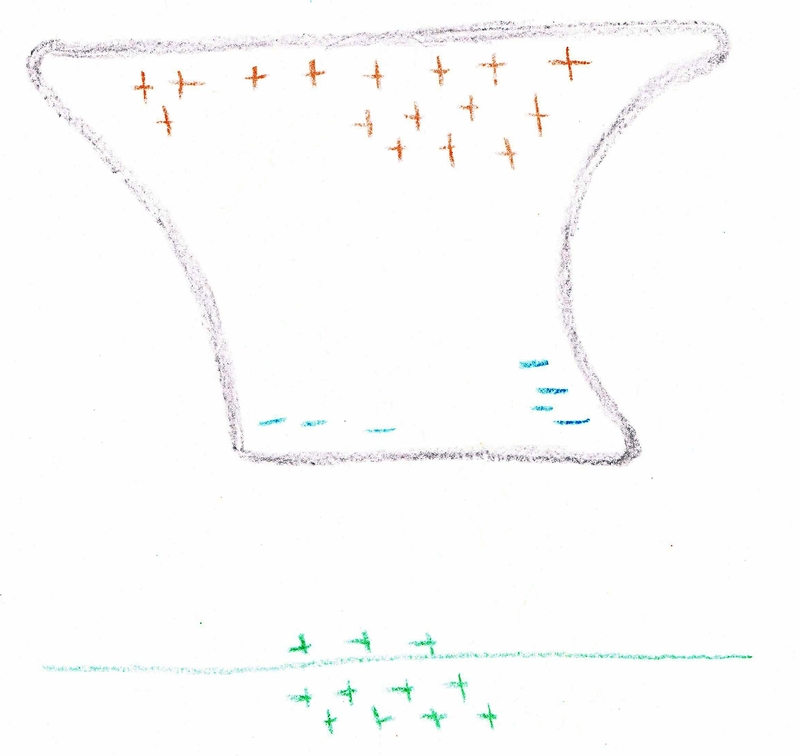 Small ice particles tend to gain a net positive charge, and the larger slushy particles tend to acquire a negative charge. 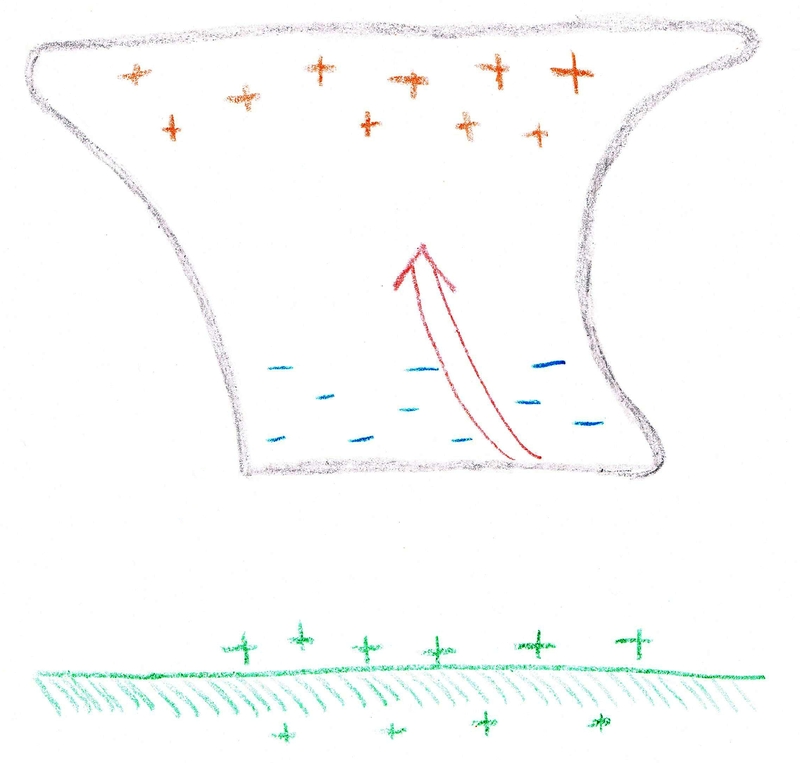 The (positively charged) ice particles are smaller and are more easily pushed to the top of the cloud by the updraft, while the negatively charged slush particles particles fall to the middle and bottom of the cloud. The Earth also acquires a net positive charge in the area underneath the storm, as the concentration of negative charge at the bottom of the cloud induces a positive charge directly below it. The red arrow is the updraft that drives the circulation within the cloud. 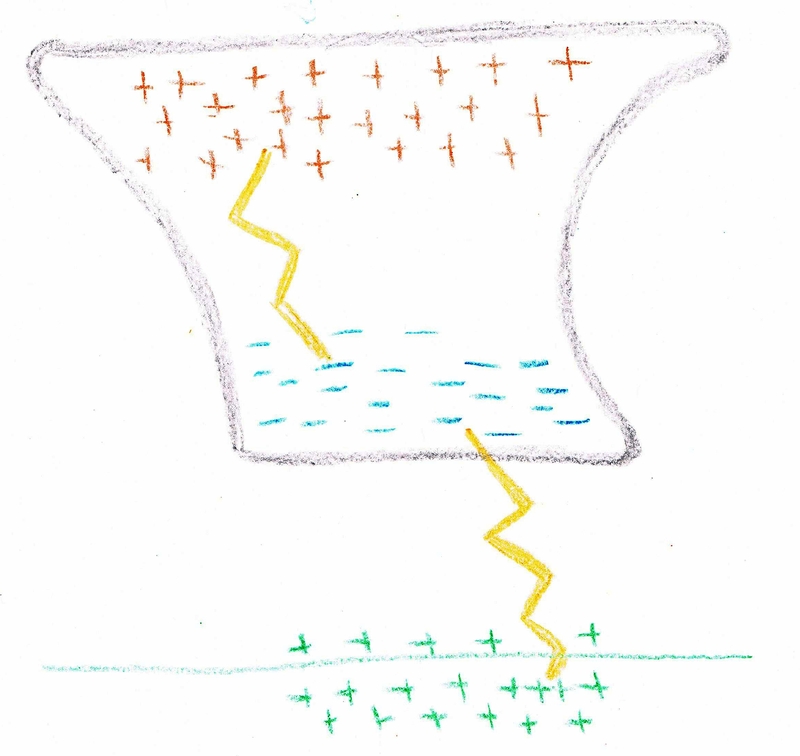 The net difference in electrical potential builds up, until the neutral air and water vapour in between the positive and negative regions can no longer sustain the difference, and a lightning bolt discharges the electrical energy. Air is a very good electrical insulator (ie, it is difficult for an electrical current to pass through the air), so a very large electric field can be sustained in the cloud before a lightning bolt discharges the stored energy, and returns at least part of the cloud to a neutral electrical state.